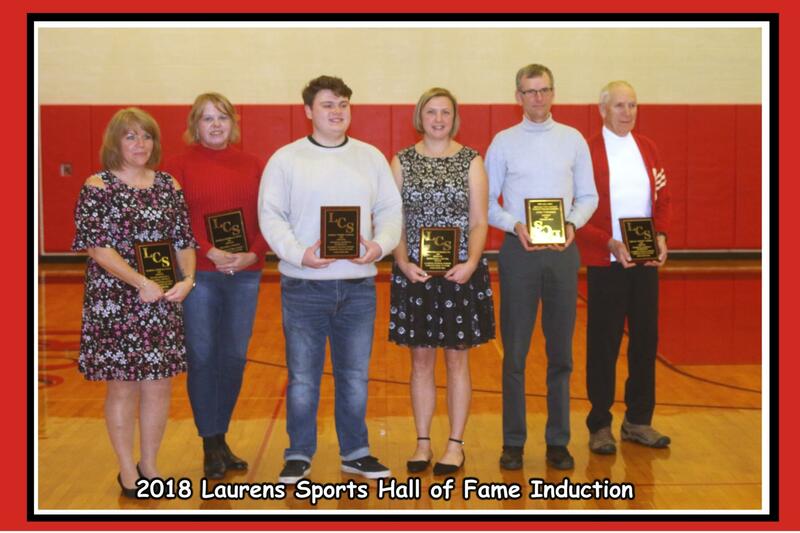 On Friday, December 28th, 2018 the 11th Annual Athletic Hall of Fame Induction Ceremony was held at LCS with six individuals being inducted. It was a very special night for our inductees as this school holds many fond memories for each. 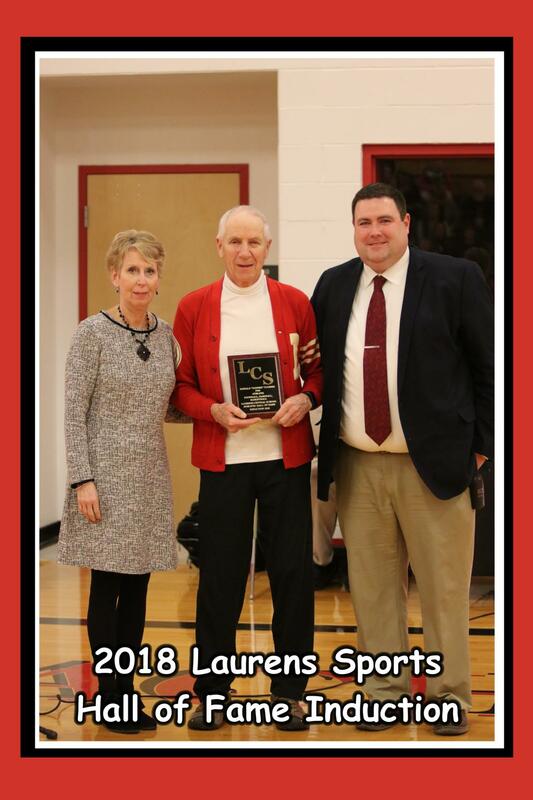 The inductees have either participated as an athlete representing Laurens Central School, have contributed to our athletic programs over many years or have contributed much to promote athleticism through their work and life choices. 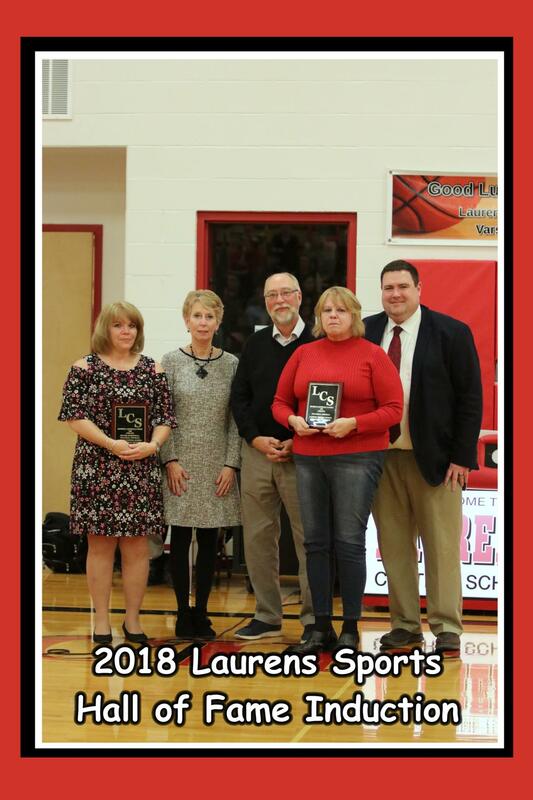 This year we were proud to induct six individual athletes to the LCS Athletic Hall of Fame. Mr. Barker is a 1968 LCS Alumni. While in high school he was a three sport athlete, playing football, basketball and baseball. He also participated in wrestling, track, and rifle club when the activities were offered. Robert was the senior class president, Prom King, and a member of Student Council. In his senior year, he led the football team in scoring with 92 points, scored 378 points on the basketball team and hit .521 in baseball. He was a member of the 1965 Tri-Valley Co-Championship Baseball team, and a member of the 1965 and 1967 Tri-Valley Championship Football teams. Bob was the Athlete of the Year for the senior class of 1968. According to many athletes, Bob was a key element of the “Bush-Barker” series of football plays as Coach Grasso named them. Coach Grasso developed an offense that was fashioned after the old single wing formation used previously by professional and collegiate teams. It took advantage of Bob’s ability to fiercely block the opponents’ defensive end for teammate Les Bush or carry the ball on a counter play going the opposite direction. Years later, our own Varsity basketball coach Andy Carr, can remember Coach teaching the “Bush-Barker” series of football plays. As a member of the class of 1968, they started their senior year in the “new 1967 gym,” what is now the cafeteria, kitchen, serving area and fitness center. There were no more risers to set up in the side hallways to allow spectators to what through the archways into what is now our high school library, and the team was very excited for the season. As tenacious as Bob was on the football field, he mirrored that on the basketball court, frequently stealing the ball from the other team and beginning a fast break. He was difficult to defend as he cut down the lane heading to the hoop. He could shoot or dish off the ball to an open teammate. In baseball he played shortstop and was always getting on base with this batting ability. After high school Bob attended Broome Community College for two years, playing basketball on a limited basis, and as he stated, “Playing for Laurens I was a big fish in a little pond. Moving onto college ball was a rude awakening.” He then went onto finish his final two years in Jacksonville, Florida earning a degree in accounting. Mr. Barker presently lives in South Carolina with his wife, Nancy Abernaty, an LCS graduate as well, and two daughters. They two daughters from Russia in 1988 and 2000. Both girls are attending Clemson University. 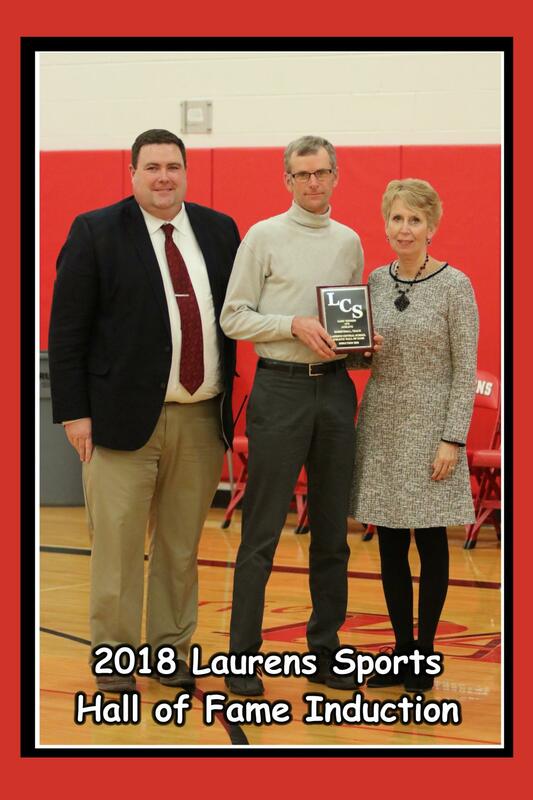 He was very disappointed in not being able to make the trip, but is very proud and honored to be a member of the LCS Athletic Hall of Fame. To accept the plaque on his behalf was nephew Christopher Barker teammate, with teammate Les Bush presenting the award. Mr. Barker was nominated for membership by Mrs. Donna Decker and Mrs. Linda Fink, and members of his graduating class. Donald “Donnie” Toombs is a 1968 LCS Alumni. While in high school he was a three sport athlete, playing football for one year, basketball and baseball for four years each. He also participated in chess and rifle club when the activities were offered. During the 1966- 67 basketball season he scored 279 points and had 3 games where he scored 38 points in each game. He was a member of the 1965 football team that won the Tri-valley Championship with 7 wins and 0 losses and the 1965 Tri-Valley Co-Championship Baseball Team for which he was the pitcher. Between the Baccalaureate service and his graduation ceremony, he had a motorcycle accident. Some say that Coach Grasso helped to save his life and his leg as Coach held him still until the ambulance got there. Donnie broke his neck and injured his leg in that accident. He was in the hospital from June to October of that year. After the accident Donnie began working for Grand Union and the company sent him to school to be a butcher/meat cutter. A few years later he started his own shop, what we all know today as “Donnie’s Meat Market.” He is one of the most well known butchers in our area, and especially well known by local deer hunters. As a member of our community he has donated generously for many of our school activities and fund raisers over the years. After high school Donnie he married his high school sweet heart, Charlene Halstead. This year marks their 48th year of marriage. His father, his wife, their two daughters, Heather and Lori, and two grand-daughters, Lakin and Lynzi. That makes four generations of his family that have graduated from LCS. He was not able to attend the ceremony, but is very proud and honored to be a member of the LCS Athletic Hall of Fame. To accept the plaque on his behalf was cousin, Mr. Neil Toombs. Mr. Toombs was nominated for membership by Mrs. Donna Decker and Mrs. Linda Fink, and members of his graduating class. Gary Toombs graduated from Laurens in 1975. Gary participated and lettered in basketball and track during his high school years. There are no records for track during those years but as others recall, he was undefeated in the mile and two mile events for both of his junior and senior years. In addition, he was honor society and a prominent member of the prestigious LCS band, under the direction of Mr. Joseph Mone. After high school Gary attended Morrisville Ag and Tech graduating in 1977 with a degree in Mechanical Technology. He began working at Bendix Corporation in Sidney, now known as Amphenol Corporation where he is still employed after 41 years as a Mechanical Design Engineer. Following college, he married Lynda Fraher, LCS class of 1975. They currently live in Oneonta and have three children and 6 grandchilden. It is his after high school career that that has been truly remarkable, and gave cause to his nomination. For nearly 45 years, he has devoted his life to personal fitness through walking, running, biking, skiing, canoeing and swimming. His records and accomplishments are many. In addition to his own personal accomplishments, Gary has served on the committee for the “Opportunities for Otsego River Ride” for 10 years. He has served in various areas of ministry in his local church, currently serving on the Elder Board. And, he has participated in 25 of the last 27 Youth for Christ Bike Trips. He is the bicycle mechanic for the trip! Mr. Toombs was nominated for membership by Mr. Daniel Martin. Christine “Parker” Cox graduated from LCS in 2001. While in high school Christine was a three sport athlete, participating on the Varsity Soccer and Basketball teams for four years and on Varsity track for two. She was a Tri-Valley all-star in both soccer and basketball, being selected for the first team once and honorable mention twice in soccer, and being selected to the Tri-Valley second team as a sophomore and the first team in both her junior and senior years in Basketball. After high school Christine attended Hudson Valley Community College where she played on the varsity soccer team. In 2002 she was selected as the “Woman’s Soccer Most Valuable Player.” And, in 2003 she was accepted to the “Who’s who among students in American Junior Colleges. 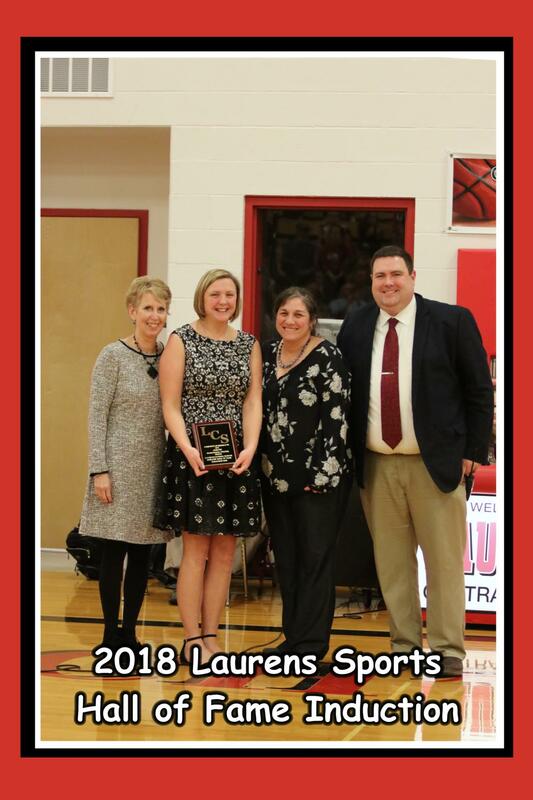 After graduating from Hudson Valley in 2003, she attended Cortland State University and graduated in 2005 with a Bachelors of Science Degree in Physical Education. Mrs. Cox began her teaching career working for the ONC BOCES teaching Adaptive Physical Education. In 2007 she accepted a Physical Education teaching position here at Laurens Central School. In addition to teaching, she presently serves as the coach of the Girls Modified Basketball team. She also serves on the Laurens Emergency Squad and teaches AED/CPR certification classes to our seniors, faculty and staff. Mrs. Cox, her husband and two daughters live in Mount Vision and her children, Libby and Kelsey attend LCS. Both of her parents, her brother, and many aunts and uncles have attended our school. Mrs. Cox was nominated for membership by members of the Athletic Hall of Fame committee. Mrs. Bonnie Johnson, one of Christine’s high school coaches, assisted in the presentation of the award. Kimberly Kimball Chase graduated from LCS in 1988. While in high school Kim was a four sport athlete, playing soccer, basketball, volleyball and softball, lettering at the Varsity level for each sport for four years. She was nominated for Outstanding Athlete in her junior year of high school, a reflection of her supportive and consistent efforts as an athlete. She was known as a very coachable and talented athlete. Quiet, well-liked by her peers, and an individual that placed team above herself. After high school Kim attended Cortland State University, earning a Bachelor’s Degree. She and her husband, Mike presently live in Milford, New York, have two daughters who were very active in sports at Milford High School, and like their mother, have continued to coach and/or participate in soccer and softball as adults. Kim, herself, continues to participate in Recreational Softball, and is a member of the Milford Athletic Booster Club. Kim was nominated for membership by her sister, Mrs. Richelle “Kimball” LaPolt. Mr. Karl Brown, one of Kim’s prior coaches, assisted in the presentation of the award. This year the Committee approved a “Surprise” nomination and induction to our Athletic Hall of Fame. 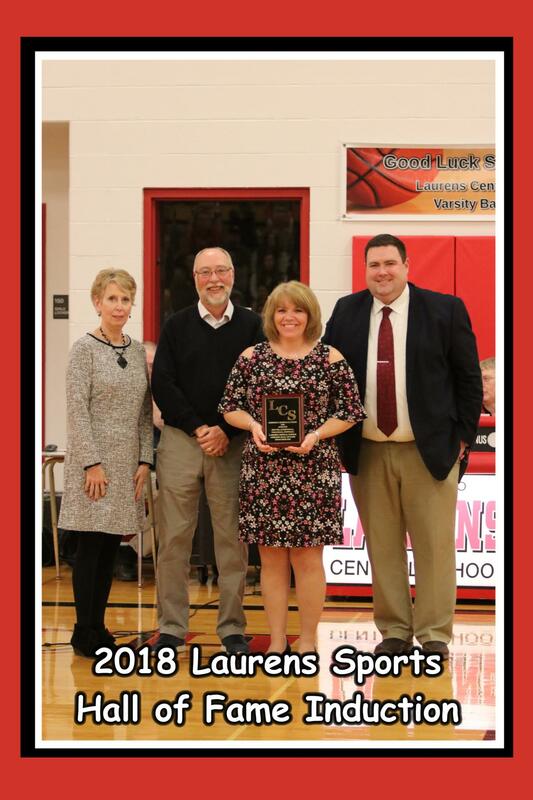 As a former soccer, volleyball, basketball and softball coach for LCS, Mrs. Wenck, like many coaches, has created a list of candidates that she believes to be worthy of induction to the LCS Athletic Hall of Fame. Over the past 10 years, several of those candidates have been brought to the committee and accepted. Richelle was “on Mrs. Wenck’s list” and when Richelle nominated her own sister for induction the committee agreed that it would be a fun idea to reciprocate and induct her as a “surprise” candidate. In high school Richelle played Volleyball and Softball for four years, earning a varsity letter for each of those years. In volleyball, she had the most outstanding, and unreturnable, overhead serve of anyone on the team. In softball, her coach, Mr. Karl Brown, shared that she had the most accurate and fastest side-arm throw from the short stop position he had ever seen. So, while Richelle chose to nominate her sister as a candidate, the Committee chose to honor her with induction into the LCSD Athletic Hall of Fame. To assist with the presentation of the award was one of her high school coaches, Mr. Karl Brown. The “Athletic Hall of Fame” committee members. The LCS Athletic Booster Club for their support of this program. Our cafeteria staff for the wonderful dinner that was catered for the Inductees and guests. Mr. Banewicz and the members of the LCS Jazz band for playing during dinner and at the program. Miss Anna Bell for a wonderful performance/singing of the National Anthem during the ceremony. Our custodial staff for all of their support and hard work involved in setting up this event. The LCS Board of Education for their continued support of this program. Thanks to all for making this event possible! !